Unlock the mysteries of the year's most spellbinding film from the producers of Crash and Sideways! Oscar nominees Paul Giamatti and Edward Norton lead an all-star cast in this "stunning" film (USA Today) that conjures an exhilarating blend of suspense, romance and mind-bending twists. The acclaimed illusionist Eisenheim (Norton) has not only captured the imaginations of all of Vienna, but also the interest of the ambitious Crown Prince Leopold (Rufus Sewell). But when Leopold's new fiance (Jessica Biel) rekindles a childhood fascination with Eisenheim, the Prince's interest evolves into obsession ... and suddenly the city's Chief Inspector (Giamatti) finds himself investigating a shocking crime. But even as the Inspector engages him in a dramatic challenge of wills, Eisenheim prepares for his most impressive illusion yet in this "mesmerizing" (Entertainment Weekly) and "beautifully acted" (Good Morning America) film that "teases you until the very end!" (The New York Times). $927.956 thousand on 51 screens. When two movies with similar themes hit screens in close proximity, logic would seem to dictate that one that debuts first should earn the most money. After all, the first one out of the gate gets to look fresh, while the second effort may come across as a wannabe. However, box office reality indicates otherwise. For instance, in 1998 Antz came out about six weeks before A Bug’s Life but barely made half of the latter’s $162 million gross. The same year, Deep Impact emerged almost two months before Armageddon but its $140 million gross trailed substantially behind Armageddon’s $201 million. Exceptions to the rule definitely exist, but it’s still strange to see how logic flip-flops so often. Such was the case with 2006’s two period flicks based on magic themes. The Illusionist came out September 1 (in wide release) and made $39 million, while The Prestige debuted October 20 and earned $52 million. That’s nit an enormous difference, but the pattern remains surprising. 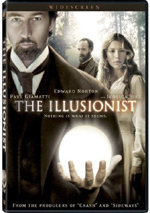 Illusionist introduces us to Eduard Abramovicz (Edward Norton), aka Eisenheim the Illusionist. He stirs up the locals in Vienna, and that gets him arrested by Chief Inspector Walter Uhl (Paul Giamatti). The movie then flashes back to show how a teen Eduard (Aaron Johnson) got interested in magic as well as his schoolboy romance with wealthy Sophie (Eleanor Tomlinson), the Duchess von Teschen. We see the obstacles they encounter since a girl of noble birth shouldn’t be with a common boy. Eduard disappears for 15 years before he comes to Vienna as Eisenheim. There Sophie and Eisenheim reunite when she comes to one of his shows. She’s romantically involved with Crown Prince Leopold (Rufus Sewell). Eisenheim’s work frustrates the Prince, and he orders Ulm to shut down the show. This doesn’t stop an affair between Eisenheim and Sophie, though. The movie follows the love triangle and its repercussions as we head back toward the arrest that launches the film and then beyond that point. Since I’ve not yet seen The Prestige, I don’t know how it’ll compare to The Illusionist, but it hope it presents a more engaging piece of work. While consistently intriguing and entertaining, Illusionist lacks a certain something to make it more winning. Part of the problem stems from the plot’s blandness. Essentially the movie takes a standard love triangle and casts it in unusual garb. To be sure, the emphasis on magic creates an interesting framework, but it can’t quite mask the inherent drabness of the basic story. This is the kind of tale we’ve seen told many times, and all the illusions can’t spice it up to a notable degree. Plot holes cause additional distractions. I won’t discuss specifics since they’d give away many of the movie’s surprises. I just know that when the film finished, I found myself preoccupied with too many questions about it. I think the flick suffers from too many gaps in logic and other stretches that we must accept, and I can’t quite swallow all – or even more – of them. The cast helps make things more interesting – at least to a moderate degree. To my surprise, the talented Norton fails to provoke much reaction. He gives Eisenheim a little depth but doesn’t make the character particularly intriguing or memorable. He also doesn’t ignite any sparks with Biel, as they create a rather lifeless romance. Giamatti creates a moderately more interesting personality but can only do so much. He brings out a nice sense of Uhl’s conflicts as a “commoner” who dallies with royalty and aspires to a better place. We can sense his origins and his desire to move up in the world, but Giamatti never makes Uhl a grasping, scheming villain. He’s the most compelling character in the film. Unfortunately, The Illusionist simply lacks much to keep us involved from start to finish. The movie offers reasonable entertainment but never becomes anything particularly absorbing. This is the kind of film you watch, you enjoy to a degree, and then you forget it. 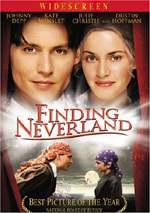 The Illusionist appears in an aspect ratio of approximately 1.85:1 on this single-sided, double-layered DVD; the image has been enhanced for 16X9 televisions. The transfer consistently looked very good. Sharpness appeared fairly solid, but some softness occurred. Most of the movie came across as reasonably distinct, though. Only occasional shots looked moderately fuzzy, and those generally happened during low-light sequences. Jagged edges and moiré effects created no concerns, and I also noticed no issues related to edge enhancement. Print flaws weren’t a factor, as the movie showed no signs of specks, marks or other distractions. Illusionist featured a subdued palette. The colors consistently seemed appropriate within the fairly monochromatic production design, as they reflected a yellow/brown tone. The film replicated the hues accurately fit within the movie’s spectrum. Black levels also were fairly deep and dense, and shadow detail looked fine. This was a good representation of a challenging set of visuals. As for the Dolby Digital 5.1 soundtrack of The Illusionist, it presented a reasonably good affair. There wasn’t much to the soundfield. The score displayed good stereo imaging but otherwise, much of the track stayed subdued. I noted reasonably good general ambience throughout the film, and some more heavily populated scenes – like those at performances or on bustling streets – provided a greater level of activity. The surrounds seemed fairly passive throughout the movie, but they contributed a nice sense of reinforcement, particularly in regard to the music. Trains made for some positive involvement, but I didn’t find much to make the soundfield memorable. Audio quality appeared strong. Speech came across as natural and crisp, and I noticed no issues related to intelligibility or edginess. Effects largely played a minor role in the film, but they always seemed accurate and well defined, with no issues related to distortion or other areas. The mix provided good reproduction of the score. The pieces of music came across as acceptably bright and vivid. This wasn’t a slam-bang soundtrack, but it worked for the movie. When we shift to the extras, we begin with an audio commentary from writer/director Neil Burger. He presents a running, screen-specific chat. Burger discusses sets and locations, his interest in the project and his adaptation of the original short story, cast, characters and performances, magic and effects, visual design, historical research, and other issues. Like the movie itself, Berger’s commentary proves serviceable but unexceptional. He manages to cover all the appropriate subjects and gives us a more than competent view of his movie. However, the commentary never quite becomes terribly involving. It works and delivers the nuts and bolts, but it just doesn’t turn into anything memorable. Two featurettes follow. The Making of The Illusionist includes movie clips, behind the scenes elements, and interviews. We hear from actors Edward Norton, Jessica Biel, Rufus Sewell, and Paul Giamatti. They do little more than tell us about the story and characters. It’s nothing more than a glorified trailer. Next comes Jessica Biel on The Illusionist. She chats for a whopping 89 seconds as she describes her character and briefly relates why she wanted to do the project. It’s a waste of time. Finally, we find some Trailers. In addition to the promo for The Illusionist, we get ads for Haven, Find Me Guilty and Winter Passing. The Illusionist boasts an interesting twist on the love triangle theme with distinctive visuals, but it fails to stand out in many other ways. Though the film presents acceptable entertainment, it seems lighter than air and doesn’t stick with the viewer. The DVD offers very good picture as well as appropriate audio and mediocre extras. This disc stands as an average release for an average movie.